Well done on completing the Farm Fun Readers Quiz! Now you can check out the answers and see how you went! Farm Fun: Feathers, Flowers and a Pig! 2. What does Farmer Scott tell the friends they can do on the farm? We went to visit Scott’s farm so many times, we got to do a wide variety of farm activities with Farmer Scott! It was great fun! We actually did cut the goat’s toenails and gave them medicine, rounded up the cows, the goats and the sheep, patted the baby guinea pigs, visited the chickens – collected the eggs and taught the chickens to fly, played with the dog drove the tractor (Rosemary and Stuart – not Kristen! ), had campfires and toasted marshmallows, and so much more – great fun on the farm! 3. What food does Chicky enjoy eating? 4. Who lets the chickens out of the coop? 6. How many eggs do the friends collect? 7. Where does Hammy think the pig has gone? 8. Why is Eumundi so excited when the friends realize the pig has escaped? 9. How do the friends get the pig back into its pen? When we were at the farm, we enjoyed taking the pig for a walk … we always had a bag of bread in hand, and the pig had a wonderful time strolling around with us! 11. Describe a time you wanted to go and hide, but chose to take the adventure instead. There are lots of times in our lives when it would seem to be much easier to ‘hide’ by doing nothing. Taking action can be challenging, but well worth it, because the adventure that comes as a result of taking action is SO exciting! For us, one of the biggest adventures recently is that we decided to step out an publish our Eumundi and Friends stories … when we knew nothing about anything to do with this – we just knew we had some great stories, and that other children would enjoy them! Everything else we have learned since we took the adventure!!! Now we have a website, lots of books (there are more on the way! ), a wonderful team who help us … and we are having an amazing and fun family adventure along the way! 12. Why is it OK for the chickens to be out of their coop for the day but the pig needs to go back into its pen? The chickens stay close to their coop and don’t do any harm. The pig travels widely, and can get lost or cause damage if it gets into the wrong field!! When we were on the farm, the chickens were all free range – they often got let out early in the morning by the young children who went searching for eggs, but then stayed close to their coops scratching for food during the day. At night, they always went back in to their coops, so it was easy to close the door and keep them safe. The pig did get out one time while we were staying on the farm – in the middle of the night! It woke us up because it got under our cabin and was scratching and sniffing against the poles on which our cabin was built! We didn’t know what it was at the time, so it was a little scary! We discovered it was the pig in the morning, and went on a mission to coax the pig back to its pigpen … using bread! Fortunately there were no flowers involved this time, but we were told the pig had got into the neighbour’s field one other time!!! 13. What sort of things would you like to do on a farm? It depends a bit on what sort of farm you are staying on as to what you can do on it! This farm had lots of animals, which were always fun to visit and play with. We visited Scott’s farm so many times, we also got to do lots of other farm activities with Farmer Scott – we actually did cut the goat’s toenails and gave them medicine, rounded up the cows, the goats and the sheep, drove the tractor (Rosemary and Stuart – not Kristen! ), had campfires and toasted marshmallows, and so much more – great fun on the farm! 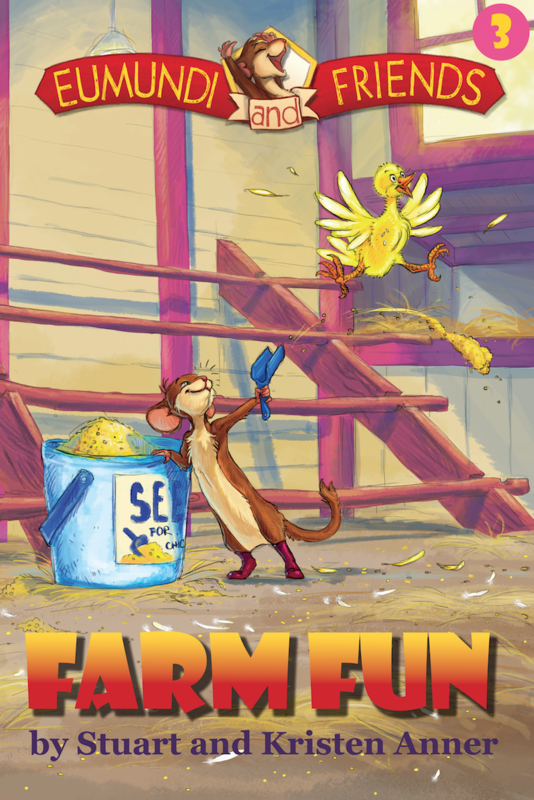 Did you leave a review for Farm Fun yet? Please click here to leave your comments – we would LOVE to hear how you enjoyed the story, and it will help others find these wonderful books! Thanks for taking our Farm Fun Quiz!! We hope you had fun and learned something new! Cake Chaos – The Story Behind the Story!